We often see voltage fluctuations in electricity supply at our home, which may cause malfunction in our home AC appliances. Today we are building a low cost High and Low Voltage Protection Circuit, which will cut off the power supply to the appliances in case of High or Low voltage. It will also show a alert message on 16x2 LCD. In this project, we have used PIC Microcontroller to read and compare the input voltage to the reference voltage and take the action accordingly. We have made this circuit on PCB and added a additional circuit on PCB for the same purpose, but this time using op-amp LM358 (without microcontroller). For demonstration purpose, we have chosen Low Voltage limit as 150v and high voltage limit as 200v. Here in this project, we haven’t used any relay for cut off, we just demonstrated it using LCD, check the Video at the end of this Article. But the user may attach a relay with this circuit and connect it with PIC’s GPIO. Further check our other PCB projects here. In this High and Low Voltage Cut Off Circuit, we have read the AC voltage by using PIC microcontroller with the help of transformer, bridge rectifier & voltage divider circuit and displayed over 16x2 LCD. Then we have compared the AC voltage with the predefined limits and displayed the alert message over the LCD accordingly. Like if voltage is below 150v then we have shown “Low Voltage” and if voltage is above 200v then we have shown “High Voltage” text over the LCD. We can change those limits in PIC code given at the end of this project. Here we have used Fan Regulator to increase and decrease the incoming voltage for demonstration purpose in the Video. 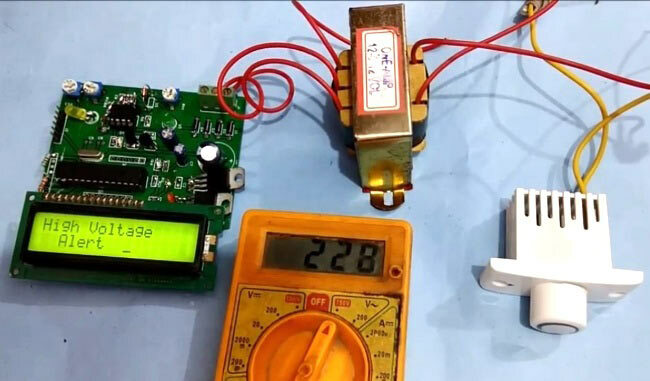 Measure and compare the AC voltage with the help of transformer, bridge rectifier, voltage divider circuit and PIC microcontroller. Detect under and over voltage by using a comparator LM358 and feed its output to PIC microcontroller for taking action by code. Here we have demonstrated first option of this project. In which we have stepped down AC input voltage and then converted that into DC by using a bridge rectifier and then again mapped this DC voltage to 5v and then finally fed this voltage to PIC microcontroller for comparison and display. where adcValue is equivalent DC input voltage value at PIC controller ADC pin and volt is the applied AC voltage. Here we have taken 240v as maximum input voltage. or alternatively we can use given method for mapping equivalent DC input value. where adcValue is equivalent DC input voltage value at PIC controller ADC pin, 530 is minimum DC voltage equivalent and 895 is maximum DC voltage equivalent value. And 100v is minimum mapping voltage and 240v is maximum mapping voltage. (Same calculation for maximum limit). Check the map function is given in the PIC program code in the end. Learn more about Voltage Divider Circuit and mapping the Voltages using ADC here. Working of this project is easy. In this project, we have used an AC voltage fan regulator for demonstrating it. We have attached fan regulator to the input of transformer. And then by increasing or decreasing its resistance we got desired voltage output. In the code, we have fixed maximum and minimum voltage values for High voltage and Low voltage detection. We have fixed 200v as overvoltage limit and 150v as lower voltage limit. Now after powering up the circuit, we can see the AC input voltage over the LCD. When input voltage increases then we can see voltage changes over LCD and if voltage becomes more than over voltage limit then LCD will alert us by “HIGH Voltage Alert” and if the voltage goes low than under voltage limit then LCD will alert us by showing “LOW Voltage Alert” message. This way it can be also used as Electronic Circuit breaker. We can further add a relay to attach any AC appliances to auto cutoff on low or high voltages. We just need to add a line of code to switch off the appliance, below the LCD alert message showing code. Check here to use Relay with AC appliances. In High and low Voltage Protection Circuit, we have used an LM358 op-amp which has two outputs connected to 2 and 3 number pins of PIC microcontroller. And a voltage divider is used to divide voltage and connects its output at 4th number pin of PIC microcontroller. LCD is connected at PORTB of the PIC in 4-bit mode. RS and EN are directly connected at B0 and B1 and data pins D4, D5, D6 and D7of LCD are connected at B2, B3, B4 and B5 respectively. In this project, we have used two voltage regulator: 7805 for microcontroller supply and 7812 for the LM358 circuit. And a 12v-0-12v step-down transformer is also used to step down the AC voltage. Rest of the components are shown in the circuit diagram below. Programming part of this project is easy. In this code, we just need to calculate AC voltage by using mapped 0-5v voltage coming from Voltage Divider Circuit and then compare it with predefined values. You can check the complete PIC code after this project. First, in the code, we have included a header and configured the PIC microcontroller config bits. If you are new to PIC coding then learn PIC Microcontroller and its configuration bits here. Then we have used some fucntions for driving LCD, like void lcdbegin() for initializing the LCD, void lcdcmd(char ch) for sending a command to LCD, void lcdwrite(char ch) for sending data to LCD and void lcdprint(char *str) for sending string to LCD. Check all the functions in the code below. To design this HIGH and LOW Voltage Detector Circuit, we have chosen the online EDA tool called EasyEDA. We have previously used EasyEDA many times and found it very convenient to use compared to other PCB fabricators. Check here our all the PCB projects. EasyEDA is not only the one stop solution for schematic capture, circuit simulation and PCB design, they also offer a low cost PCB Prototype and Components Sourcing service. They recently launched their component sourcing service where they have a large stock of electronic components and users can order their required components along with the PCB order. After completing the design of PCB, you can click the icon of Fabrication output above. Then you will access the page PCB order to download Gerber files of your PCB and send them to any manufacturer, it’s also a lot easier (and cheaper) to order it directly in EasyEDA. Here you can select the number of PCBs you want to order, how many copper layers you need, the PCB thickness, copper weight, and even the PCB color. After you have selected all of the options, click “Save to Cart” and complete your order, then you will get your PCBs a few days later. The user may also go with their local PCB vendor to make PCBs by using Gerber file. This how we can easily build the Low-high voltage protection circuit for our home. Further you just need to add a relay to connect any AC appliances to it, to protect it from voltage fluctuations. Just connect the relay with any general purpose Pin of PIC MCU and write the code to make that pin High and low along with LCD alert message code. Hi I'm using MikroC pro and this code is not running in it pls help me. Interesting to see you've managed to do it with the least components. Can you please tell me how you determined the LOW and HIGH voltage by setting it in the dc level. what is the relationship between the AC and DC voltage. He has actually converted the AC to DC and then used an op-amp in comparator mode to compare for the low and high voltage levels. It is also explained in the tutorial above read it ..
can u please explain how this voltage comparator part can be done using an Opamp without using a PIC. I want to design a circuit which cutsoff power supply below 150v and abobe 360v.